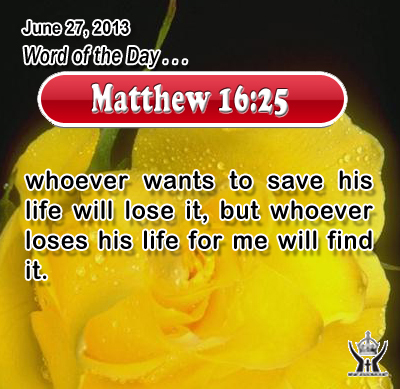 Matthew 16:25whoever wants to save his life will lose it, but whoever loses his life for me will find it. Heavenly Father, we believe that Jesus is Lord, your Son, our Savior and King. We long for his life to be made visible in us to your glory. In Infant Jesus' name we pray. Amen. 21"Not every one who says to me, `Lord, Lord,' shall enter the kingdom of heaven, but he who does the will of my Father who is in heaven. 22 On that day many will say to me, `Lord, Lord, did we not prophesy in your name, and cast out demons in your name, and do many mighty works in your name?' 23 And then will I declare to them, `I never knew you; depart from me, you evildoers.' 24 "Every one then who hears these words of mine and does them will be like a wise man who built his house upon the rock; 25 and the rain fell, and the floods came, and the winds blew and beat upon that house, but it did not fall, because it had been founded on the rock. 26 And every one who hears these words of mine and does not do them will be like a foolish man who built his house upon the sand; 27 and the rain fell, and the floods came, and the winds blew and beat against that house, and it fell; and great was the fall of it." 28 And when Jesus finished these sayings, the crowds were astonished at his teaching, 29 for he taught them as one who had authority, and not as their scribes. Builders usually lay their foundations when the climate and soil conditions are at their best. It takes prudence to know how a foundation will stand up against adverse conditions. Building a house on a flood plain, such as a dry river-bed, is a sure bet for disaster! Jesus prefaced his story with a warning: We may fool one another with our words, but God cannot be misleader. He sees the heart as it truly is with its motives, purposes, desires, and choices. There is only one way in which a person’s genuineness can be proved, and that is by one’s practice. Fine words can never replace good deeds. Our character is exposed in the choices we make, especially when we must choose between what is true and false, good and evil. Do we cheat on an exam or on our income taxes, especially when it will cost us? Do we lie, or cover-up, when disclosing the truth will cause us pain or humiliation? A true person is honest and dependable before God, neighbor, and oneself. Such a person's word can be taken as trustworthy. What can keep us from dishonesty and spiritual disaster? If we make the Lord and his word the rock and foundation of our lives, then zero can shake us nor keep us from God's presence and shelter.